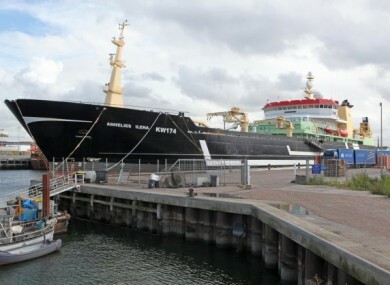 ONE OF THE LARGEST fishing vessels in the world remains detained in Killybegs port this afternoon, after it was detained by the Irish Naval Service off the Donegal coast yesterday. The LÉ Roisín detained the 14,000 tonne Dutch registered vessel for alleged breaches of fishing regulations yesterday morning around a hundred nautical miles north west of Tory Island. The vessel, the Annelies Ilena, is the largest ever detained by the Naval Service. Officials from the service are now carrying out an investigation aboard the ship in conjunction with the Sea Fisheries Protection Authority. The focus of the probe is into potential “high-grading” infringements. The prohibited practice is essentially a form of discarding, whereby legal-sized but lower value fish are ‘graded out’ and returned to the sea dead. The process maximises the economic return for vessels targeting high value stocks, but contributes to fish mortality, and is banned under EU regulations. “Vessels with the ability to catch fish on an industrial scale in waters under our jurisdiction, but which almost never land here, pose particular challenges to ensure regulatory compliance. Steele describes the ongoing investigation as a “significant ongoing operation” between the SFPA and the Naval Service and says that illegal fishing has many serious consequences for people who “depend on fisheries for food and employment”. It’s planned the vessel will remain in Killybegs until the investigation is complete. The Annelies Ilena is the thirteenth vessel detained for alleged infringements of fisheries regulations in 2013. Email “Authorities investigate potential fish discarding aboard 14,000 tonne Dutch vessel”. Feedback on “Authorities investigate potential fish discarding aboard 14,000 tonne Dutch vessel”.